Religious family with small children forced to go hungry on 20 hour journey to New York after booking company fails to provide kosher meals. A religious family flying from Tel Aviv to New York could not have imagined the 20-hour long nightmare they would endure. The family of five was forced to go without food for the duration of their journey to New York, which included a stop in Berlin, despite explicit promises from representatives of Ophir Tours, from which they booked the flight, that there would be kosher food on the flight. The father related the full story to Arutz Sheva. "On August 16, we ordered five airline tickets from Israel to New York, which we found at a good price on the Ophir Tours website. The flight was through Air Berlin, and included a five hour stopover in Berlin." "We contacted Ophir Tours to make sure that all the details on the site were correct, and the representative we spoke to was kind and pleasant and suggested that we book the flight through them and not through the website so that no problems would arise. It costed an additional $10. We agreed and [booked the flight] through them. 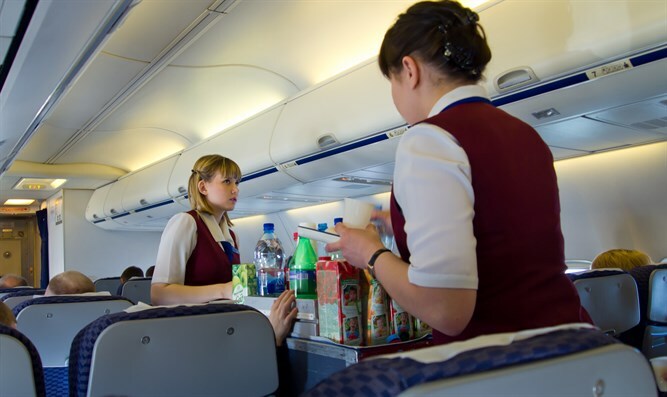 The father explained that the issue of kosher food had come up during the phone conversation, and that he had explicitly requested to be able to receive kosher meals on the flight. ""We wanted to make sure kosher meals could be ordered and she said she ordered us kosher meals and that everything was arranged." "We went on the flight on August 20 with three tired children. There were no meals served on the first flight. There were snacks which were not kosher and no kosher snacks for us. About four hours later we we stopped in Berlin for about 7 hours because of a problem with the company. We did not find anything kosher in Berlin. The nightmare was only beginning. "Before we boarded the plane, we asked again the air stewards of Air Berlin for Kosher meals and they said that if we ordered more than 48 hours before the flight we would have kosher meals. We were very pleased and we encouraged children that they would be able to eat soon. When we were on the plane we found to our amazement that there were no kosher meals for us. We flew for about 20 hours without kosher food. Needless to say, it was a terrible experience. The booking with Ophir Tours ended in anguish." According to the father, the company refused to take responsibility for the incident. "The day after we arrived in New York, we tried to contact Ophir Tours' customer service to file a complaint and receive compensation. "After a long wait, a representative answered our claim by saying that they told us that there was no kosher food, and that if we were interested, we could write an e-mail to file a complaint." "This was not true, and if we had known we would have planned accordingly," the father said, adding that "immediately we wrote an e-mail and sent it, but unfortunately we have not received any response to our e-mail until now." "It is important for us to publicize the case in order to warn other families who are flying through [this company]," he said. The company said in response that customers were booked for a flight to New York with Air Berlin on 16/08 for departure on 20/08 (four days from the date of booking). The company claimed that according to its records, the clients had inquired about kosher meals and were informed that the company would look into the matter, but would not be able to guarantee that kosher meals would be available. "In any event, no meal is served on the flight between Israel and Berlin, and we cannot guarantee on behalf of the airline the availability of special meals or their composition. We regret the aggravation caused to the client," the company concluded.